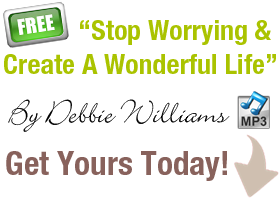 If you are a worrier then this is another strategy to enable you to stop worry in it’s tracks. When my friend Paul McKenna was researching for his book ‘I can make you rich’’ he interviewed many millionaires and what amazed him was how calm they seemed. He was curious how could they be so laid back not worry yet make decisions which could potentially cost them and their business fortunes? Each millionaire he asked he noticed a similar response. They all used a process that is known as downside planning which involves worrying but with a third crucial step. Think about the upcoming event, business deal or transaction in detail. When they did this and realised they could handle the worse possible outcome if necessary then it was all guns blazing to the outcome they really wanted. Think of all the things which worry you. It will help if you write them out on a piece of paper. Millionaires are known for their list writing and rightly so as it gets it out of your head and allows you to develop strategies and plans for a better future. Consider, imagine all that could go wrong with everything you worry about. Again writing them out means you can see from the outside in. Plan a solution or an acceptance that you could handle the worse outcome to every issue or maybe even realise how totally unlikely your worry would actually happen. Now its time to focus on what you want to have happen instead and devise a step by step plan to get it. Follow your plan for a successful outcome and make adjustments along the way as necessary if any new worries or concerns come up. Stop binge drinking now. How to stop abusing alcohol with hypnosis and NLP effective treatment. Learn to drink like a normal person does drinking moderately and not overdoing it with Birmingham hypnotherapist Debbie Williams help. Binge drinking is one of the reasons liver disease has increased in the UK over the last 10 years. It kills 16 people in every 100,000. Cirrhosis of the liver is increasing in women binge drinkers whose liver’s don’t tolerate alcohol as well as men. Alcohol is toxic to the body’s cells when consumed in excess. Waking up the next day after a binge drinking episode and not being able to remember parts of the evening before is an example of alcohols ability to damage the brain. If you suffer from blackouts after consuming vast amounts of alcohol, now is the time to sort this out. If you can travel to Birmingham to see Debbie Williams at her Birmingham NLP and hypnotherapy clinic in Sutton Coldfield then call her on 0121 241 0728. Prices start from £145 per session. Birmingham hypnotherapist Debbie Williams has helped 100’s over the years to overcome their binge drinking habit usually in only 1-3 sessions. Birmingham hypnotherapist Debbie uses NLP to help you to ‘think’ differently about drink. NLP is like finding the owners manual for your brain and with the full length recording stop binge drinking there are several NLP based tracks to help you to reprogramme your brain to stop binge drinking now as well as a full length hypnosis track which will plant suggestions deep into your unconscious mind to help you to stop binge drinking. You can read more here about “Stop Binge Drinking This self help hypnosis and NLP recording costs only £19 and comes with a full money back guarantee to go on click the link and download your copy now you have nothing to lose but your binge drinking habit. If you need help to stop worrying then my free hypnosis recording ‘Stop Worrying’ listened to regularly will help you to feel much calmer and happier in yourself. You see, the truth is while you’re consumed with worry you’re far too busy to do anything to really sort the issues out – which also stops you from having to come up with better solutions. Why no fill in the form to your right and get your download right away and start to eliminate needless worry from your life once and for all. Does Worrying Makes You Procrastinate? Does worrying about things make you constantly procrastinate or dwell on relatively unimportant things like making that phone call to a distant family member or friend and then conveniently for you, you occupy your mind, believing that you are “working on it” yet don’t follow through on what your imagination perceives to be a potentially awkward conversation as you are worrying needlessly about this? P.S. If you have other issues you want help with, I have recorded over 30 self help hypnosis recordings which are like having a one to one session of hypnotherapy and NLP for a fraction of the cost.